Embarking on the third hike inside two days was so much exhilarating. 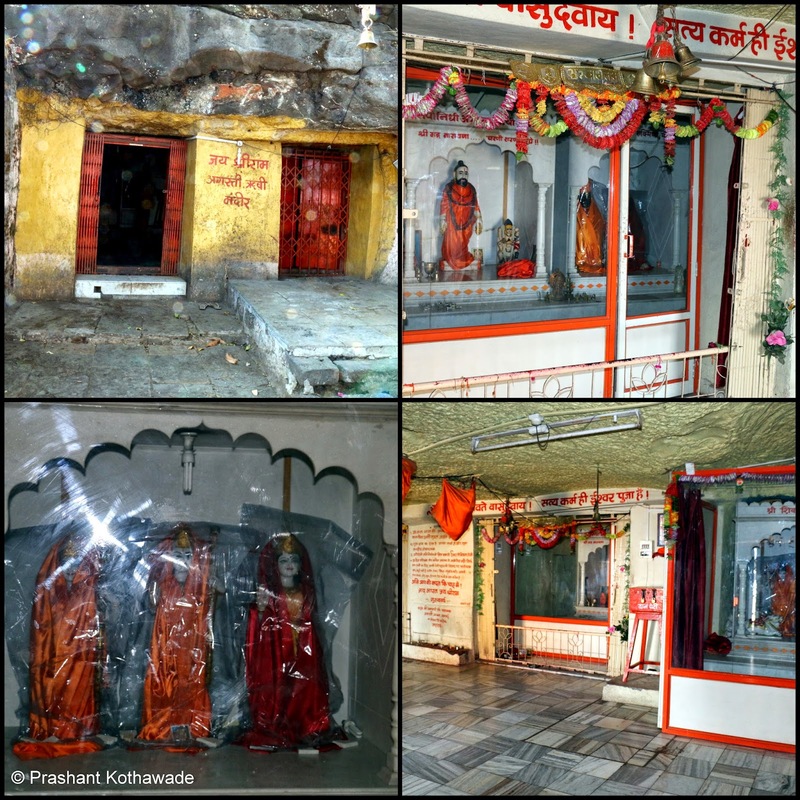 As Manmad region is very far from Pune where we stay, we knew we would not visit this area too soon and wanted to make the most of our time in this area. Strong fortification of the fort caught our immediate attention as soon as we reached to the base of Ankai-Tankai forts. It was near to 10 am when we reached to the base. Weather was neither too harsh nor too pleasant when we started our hike. Approach to these twin forts has been made very easy by constructing the concrete steps at the start. These steps lead you to Jain caves. There are some remnants of Dargah as you start your ascent. We decided to visit Jain caves later as we had to cover two forts before it became too hot. So we proceeded towards the col. Approaching to col was also easy. Monkeys are the troublemakers in trekker's life. Some of the monkeys are aggressive and can attack you for food. Particularly, monkeys which are fed by humans lose the fear for human and look upon humans as source for food and if not given, they can attack. A battalion of monkeys greeted us at the base of Tankai and we immediately changed the plan of visiting Tankai first and proceeded to Ankai. Ankai, also known as mountains of Agasthi Rishi is a very ancient fort. Fortification of this fort is in great shape and you pass through seven gates. Along the way there are more caves with nice carvings. These are not well maintained as compared to Jain caves at the base. Bats rule inside the caves and you just cannot enter the caves. As we ascended further, we came across a cave named "Seeta Gumpha". Currently it is used to shelter a cow. Though previously, it was used for staying but because of the cow-dung, it is no more suitable for halting at night. Temple of Agasthi Rishi is in good condition. It is probably renovated recently and has marble flooring. As soon as entering the temple, serenity prevailed and immediately a spell of 5-10 minutes of meditation refreshed the mind. After resting in the temple, we started exploring the western part of the fort. By that time, Sameer and Tushar were far ahead of us and out of sight. A small temple was standing proudly inside a pond and its reflection was looking enchanting. Different water cisterns in the fort. There were few small birds near the water cisterns. A bird caught my attention which was walking and flying very near to ground. It was camouflaged with the color of the ground. I tried to capture few photos but because of its continuous movements, soon I gave up and proceeded further. There is a large dilapidated structure probably the mansion on the fort. There were no signs of Tushar and Sameer. As I was about to shout for their names, I spotted them perching on the rocks and munching on the snack.Soon, we all joined them one by one and we munched on the snacks. Soon, we were done with the exploration of different structures of the fort except Citadel. As there was nothing to explore on the citadel, we decided to skip it and quickly descended to the col between Ankai and Tankai. As it was becoming hotter and hotter and Tankai top was still looking distant, I gave the option to Amol who seemed visibly tired to rest at the base of Tankai till we returned from Tankai. Amol readily accepted the offer but Tushar thought otherwise and asked Amol to continue so as not to regret of visiting Tankai later. After some deliberation, Amol, too, agreed and we all started hiking on Tankai. There was no trace of monkeys which were abundant during morning. Probably they had gone to some shade to protect themselves from the heat of unrelenting sun. A massive plateau greeted us as soon as we landed on top of the fort. 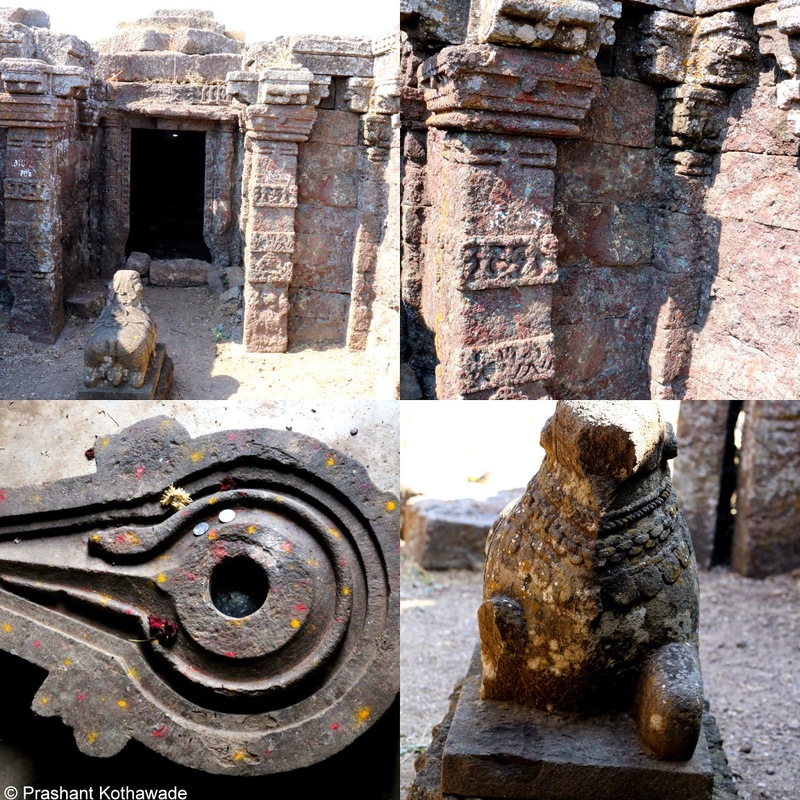 Remnants of the Lord Shiva Temple remind us of its beauty in its heydays.Unfortunately it remains in dilapidated condition as it could not withstand the nature's forces and total neglect. Plateau was so big that once in the middle you cannot see what lies immediately below its boundaries. We thought that temple was the only thing to explore but seeing Tushar and Amol venturing the far end of the eastern side, we also followed them and were ecstatic to see few more structures - remnants of the kabar and water tanks. After visiting Eastern part, we proceeded towards Southern part as Tushar and Amol were perching on the ground. They asked us to visit few more water cisterns on the Southern side. Again, these water tanks were not visible from the large plateau. Soon, we were back to Jain caves carved at the base of Tankai Fort. These caves are well maintained and particularly well protected from the bats. There are stunning sculptures inside the caves that leave you spellbound. Unfortunately, we did not have much time to explore as we had to travel back 250kms to Pune, Therefore we quickly checked 3-4 caves and skipped the rest and proceeded towards the base. 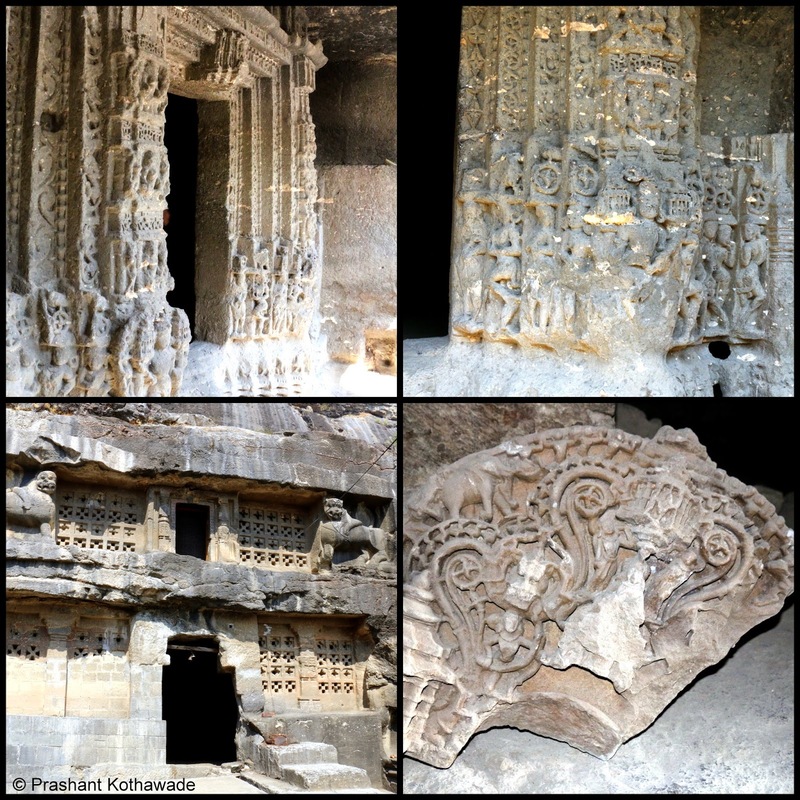 Glimpses of the beautiful carvings: You can easily spend hours if you want to explore all the caves in detail. We started our journey back to Pune around 1.15 pm, had a lunch at a restaurant along the way and reached to Pune around 7pm marking the end of remarkable two days spent in the wilderness. 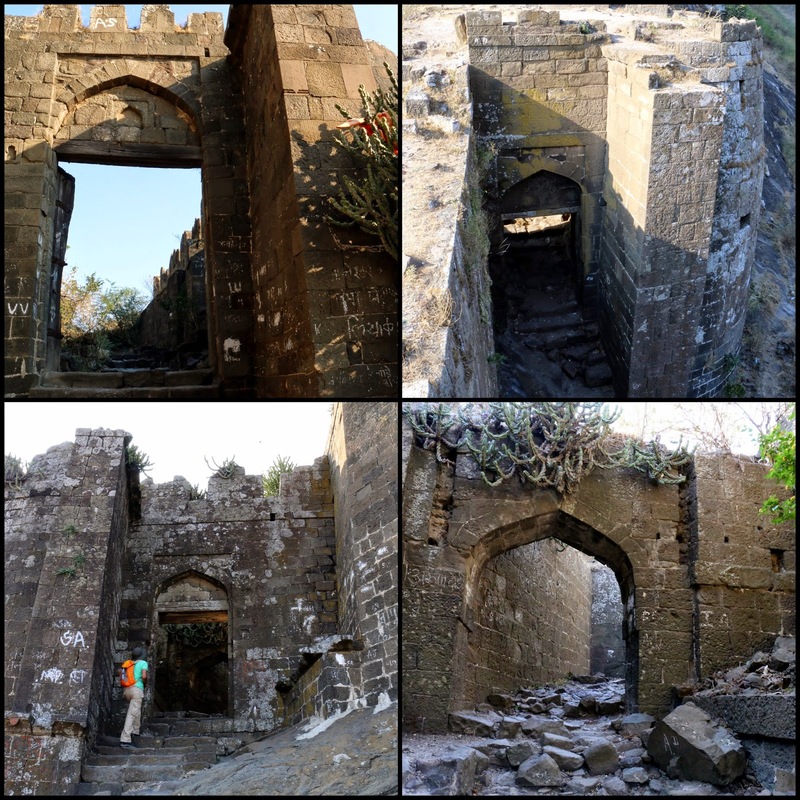 There was a sense of utter joy as finally the forts in Manmad region were finally conquered. As I am penning this, fluttering of peacocks in the temple near Katra is still ringing in the ears. Thrill of adventurous and impromptu decision to cover the whole Katra-Shambhu Mahadev region with a difficult rock patch still sends goosebumps in the stomach. A night spent in the temple at the base of Gorakshanath Fort with many sadhus is still vivid in the memory and the massiveness of twin forts of Ankai-Tankai seems to be imprinted in the memory forever. Special thanks to my cousin - Mr. Sanjay Amrutkar (a well-known trekker, photographer and writer on the subject of trekking in Sahyadri) for helping to plan this hike. More about the history can be found here. In 2 days, you can easily cover 4 forts - Ankai, Tankai, Gorakshagad and Katra. If you have more time, you can also visit Chandvad region forts. Stay can be made at the base of Gorakshagad or Agasthi Rishi Temple on top of Ankai Fort. Guide is recommended to hike on Katra Fort. Pratap, I would be glad to share my photos if it can help you increasing the tourists in your area. Let me know which selected photos you need and I will send them across.